Whiskey bottles in my collection on display for a whiskey tasting. 1. Know the difference between the types of whiskey. 2. Decide which whiskies you wish to share. 3. Be able to talk about a) whiskey in general, b) each individual whiskey. Recently, I held a whiskey tasting for a small group of friends. Over the past several months, I’ve amassed a small collection of whiskies, and decided to share them. I announced a date far enough in advance to make sure enough could plan and attend. Prior, I asked around, casually, if people would be interested. There were, with several admitting their lack of whiskey knowledge. In between the booking of the date and the tasting, I did research. In order to get a history of the drink, I ordered a copy of Kate Hopkins’ [easyazon-link asin=”B00375LMUM”]99 Drams of Whiskey: The Accidental Hedonist’s Quest for the Perfect Shot and the History of the Drink[/easyazon-link]. 99 Drams tells of Kate and her friend in search of what would make someone spend $10,000 on a rare bottle of whiskey. As they search, Kate tells of how whiskey and the various types—scotch, scotch whisky, Irish whisky, bourbon and other variants came to be. Like all alcohol, sordid political games influenced the making and evolution of the drink. The book provided enough insight and clarity to cover the distinction between the different kinds. It’s like a travelogue for whiskey. I also picked up two coffee table books, which were basically the same. [easyazon-link asin=”0756654432″]World Whiskey[/easyazon-link] and [easyazon-link asin=”0789497107″]Whiskey: The Definitive World Guide[/easyazon-link]. Both contain many of the same pictures and same basic facts. 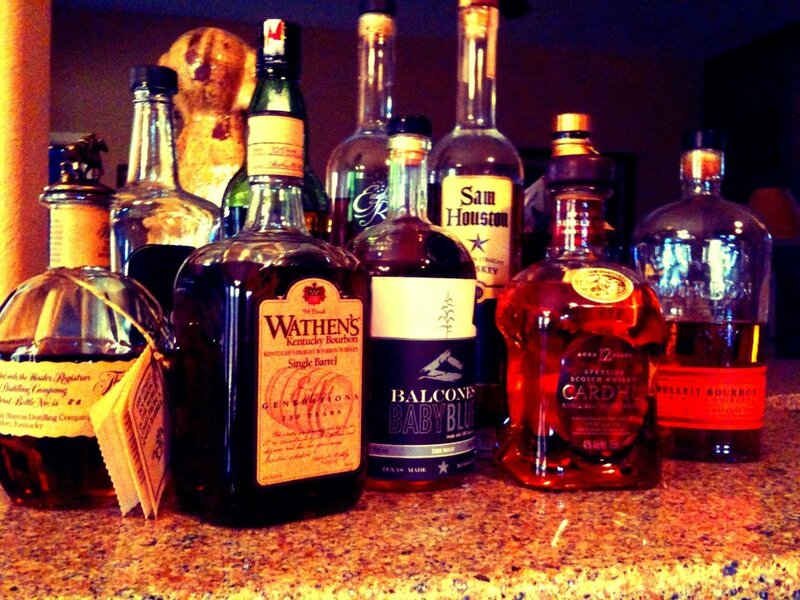 World Whiskey is newer, and I feel, better organized. Lastly, I purchased a whiskey tasting guide, [easyazon-link asin=”0955472954″]Jim Murray’s Whisky Bible[/easyazon-link], an odd, legal envelope shaped book with a plethora of tasting notes for thousands of whiskies. It’s hard to read but interesting guide. All books were purchased used on Amazon for a total of less than $20. Wikipedia helped with some minor details and pictures. I browsed whiskey maker websites to learn their story. One thing Kate Hopkins talks about in 99 Drams is, how much a maker’s story is true, or marketing embellishment. A good story doesn’t affect taste. For the tasting, I chose a sampling of the 3 main types—an Irish, a scotch (whisky) and 2 bourbons, for a total of 4 tastings. They could then have a drink of any of the 4 they tasted or venture into my whiskey collection. Before deciding on the four tastings plus one drink menu, I debated how many to serve. With everything at least 80 proof, I was going to have to minimize the serving size, number of servings and be up front with everyone showing up having eaten a hearty meal. To serve the tasting to a large group, I ordered two ounce plastic cups. They’re large enough to be held easily, distributed quickly and to pour small amounts evenly in. Given that you’re supposed to wait one hour per alcoholic drink consumed, I wasn’t going to serve full shots of whiskey. Each two ounce cup would contain about a half an ounce. The half ounce would suffice to see the color of the whiskey, smell it, and taste it and its finish. To finish out the tasting, I researched food pairings. Dark chocolates go with most scotches, pecans go with most bourbons, gouda, brie and water crackers go with most Irishes. I filled out the party plate with deli meat and pretzels. Several whiskey sites suggested fried chicken and bourbon (or American whiskey). 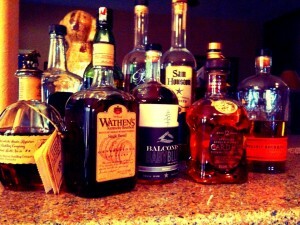 Perhaps next time, I’ll get some Babe’s Fried Chicken to go and share an assortment of bourbons. Lastly, I made a slide deck in Keynote, transferred it to the iPad and used my iPhone to control the presentation. I made the deck to keep everyone on the same footing, and with a noisy room of drinks being passed, the slides would set a bearing to what was being said. Plus, the pictures or words would trigger what I needed or wanted to say. Afterwards, I made notes in my head about how to rearrange the slides if I were to do this again. People arrived, and I offered water to everyone. We began. All the tasting articles suggested to start with the lightest whiskey first. This is akin to wine tasting. Similarly to wine tasting, you use four senses to fully taste the whiskey—sight, smell, touch (with your tongue, is the whiskey thick, thin, oily) and taste (for flavors and the finish which can leave different flavor notes). Dissimilarly to wine tasting, you add water to whiskey for a tasting. Debates rage about this practice and about how to drink whiskey in general. The water opens up various compounds from the alcohol and lessens the bite of the alcohol. High proof whiskies should be watered down to get their full flavor. For a drink, a splash of water will do. For a tasting, a few drops will work. We started with the Powers Gold Label Irish whisky. Then we moved to a bourbon, Basil Hayden’s. In between tastings I would go through a few slides about the history or the process of making the drink. Whiskey is just as diverse as wine or beer, but with most spirits containing at least 40% alcohol, the barrier to entry is higher. Personally, I’d like to see smaller bottles to lower the risk of trying a new whiskey, however, for most distillers, such a practice isn’t viable. I’ve surmised that to find what you like, take risks, ask the folks at the liquor stores, research whiskey. A devoted contingent of whiskey bloggers and tasting sites and magazines do exist. Have friends pick a bottle for a party. Different bars serve different spirits, especially four or five star hotel bars in different parts of the country. Like all subcultures, there are passionate people of all types. What’s exciting, is that Fort Worth will soon have a distillery, Firestone and Robertson. And, did you know, that if you distill beer, you get whiskey?